At Last a More Effective, More Humane Solution for Treating Cancer. We are answering the world’s call for more effective, more humane cancer treatment. NeoTherma Oncology is developing a groundbreaking type of radio frequency (RF) thermal treament for deep, solid tumors that is expected to increase the effectiveness of current cancer treatments, while minimizing the harshest effects of chemotherapy and radiation. NeoTherma’s cutting edge non-invasive technology, seamless integration into established MRI treatment suites, and clinical development strategy set us apart as industry innovators with the vision to reimagine cancer treatment. NeoTherma Oncology is a developmental stage medical device company developing a proprietary Thermal Treatment (TTx) system for deep solid tumors. Our technology is based on applying a safe, non-invasive, nonionizing electromagnetic field to produce local ‘fever-range’ temperatures in tumor tissue, intended to increase the effectiveness of anticancer radiotherapy, chemotherapy and immunotherapy. The energy emitted by our TTx device increases blood perfusion in tumor micro-environment, reversing the treatment-resistant hypoxia, and promoting a therapeutic immune response. We are integrating a novel application of electromagnetic field physics with cutting edge MRI thermographic imaging and computational simulation in a medical device that promises to be a disruptive adjuvant treatment for deep solid tumors. Evidence supports that modestly raising the temperature in the tumor microenvironment (from the normal core temperature of 37°C to ~ 42°C) significantly increases the effectiveness of radio-, chemo- and immunotherapies with negligible side effects – plus its own direct cancer cell killing effects. 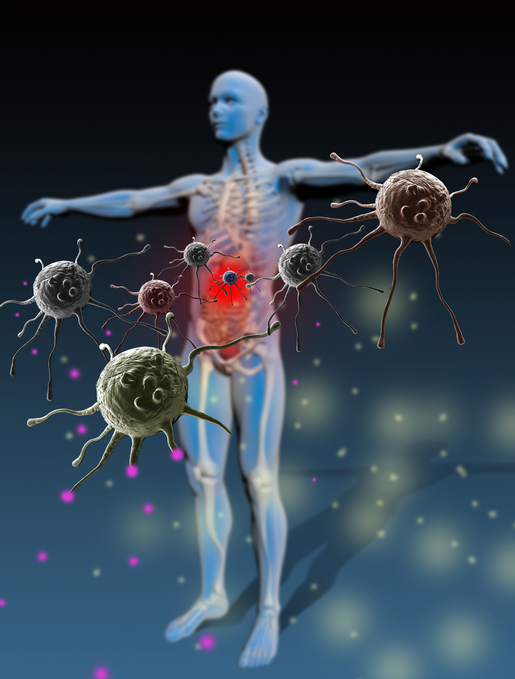 Peer reviewed evidence from a number of centers around the world suggests RF thermal therapy works by increasing blood perfusion in tumor micro-environment (allowing drugs to penetrate at lower doses), reversing radiation treatment-resistant hypoxia (increasing intratumoral reactive oxygen) and promoting a therapeutic immune response similar and likely additive to immune checkpoint inhibition (increasing immunogenic tumor cell surface protein expression). Our lead target is unresectable pancreatic adenocarcinoma, statistically the deadliest of the solid tumors, although the technology may be equally applicable to a wide range of solid tumors. Most importantly, mild HyperThermia (39-42°C) has been demonstrated to initiate an effective immune response on its own. Thus, it may be a better complement to immunotherapy than radiotherapy and chemotherapy which may suppress the main actors of the immune system. In fact, modern hyperthermia and immunotherapy originate from observations within the same studies by William Coley in the late 1800s, linking both to immune activation. Indeed, heat shock protein (HSP)-mediated antigen and other danger associated molecular patterns (DAMPs) presentation to dendritic cells and NK cells activate both the innate and adaptive immune response with subsequent cross-priming and activation of cytotoxic T cells in the lymph nodes that can traffic back to kill cancer cells at the tumor site. These successful pre-clinical results support submissions of an IDE to FDA for permission to conduct first-in-human studies in patients with pancreatic cancer. Neotherma Oncology is led by experienced healthcare executives that are working toward the dream of more effective treatments for cancer. Entrepreneur, medical device executive and clinical pharmacologist with a track record of delivering novel medical products to global markets. Skilled in accelerating global regulatory approvals, market adoption and payer coverage through clinical research study design, health economic studies & bullet-proof submissions. Formerly Entrepreneur in Residence at Rice University, executive positions at Epigenomics Ag, Bristol-Myers Squibb and Syntex Pharmaceutical Corp.
Combines 20 years of experience in instrumentation product management, global marketing and business development, R&D assessment and planning. She was leader in R&D and corporate strategy definition toward growth and profitability. She led development efforts for the successful launch of several generations of mass spectrometers for leading global JV, Applied Biosystems-MDS Sciex. During 10 years at Deloitte LLP she acted as Pharma & Biotech industry expert working on numerous R&D assessment projects, M&A technical evaluation and regional strategies. Health care business executive with demonstrated ability to assess and predict markets for growth in new and established business lines. He led commercial activities for Aspen BioPharma and their development of a novel IVD. At Radix Biosolutions, he launched its first commercial products. Prior, he worked in increasing levels of responsibility with Luminex, Safety Syringes, and Biosite. Mr. Miller received a BS in Pharmacy from the University of Iowa and an MBA from UNC Chapel Hill. 15 + years of experience in corporate finance, structure and strategy. He successfully led operations including accounting, software implementation, marketing, asset management, and communications. As VP of BGS Companies he was responsible for financial oversight, capital acquisition, and entitlement. As President of Premier Management, he assisted clients in restructuring and repositioning of assets, complex tax hearings, and debt restructuring. Chris served as interim CEO of NeoTherma managing corporate structuring and an initial capital raise. Has led the development and product design of four devices for the nation’s defense and three medical devices. At Honeywell, Chuck served as the product manager for multiple electromechanical devices. At RBC Medical Innovations, Chuck developed two radiofrequency generators (RFG) as a Project Manager which have been cleared with FDA 510(k) and EU CE-Marked. These devices represent cutting edge improvements as completely software-controlled generators with highly flexible architecture for future development. He has a B.S. in Chemistry from the Missouri S&T. Combines 15+ years bioengineering experience in device development and cancer research as a Senior Scientist at leading Texas institutions such as The University of Texas at Austin, Rice University, and the University of Texas MD Anderson Cancer. He has published more than 30 peer-reviewed publications, and is inventor in a large portfolio of patents dedicated to medical devices and methods for applications in multiple diseases, which have resulted in translational efforts to corporate partners. Pierre designs and directs pre-clinical studies needed to demonstrate the therapeutic safety and efficacy of NTO’s device and serves as a liaison to NTO’s academic research sites, CROs, and regulatory consultants. Pierre earned a PhD in Analytical/Physical Chemistry from Louisiana State University. NeoTherma Oncology also has relationships with thought-leading medical and scientific advisor and collaborates with industry leading experts to ensure expedient product development and success. Gerald Nepom, MD, PhD – Affil. Professor on Immunology, Univ. Washington; Director, Benaroya Research Inst. Zeljko Vujaskovic, MD, PhD – Director Translational Radiation Sciences, U of Maryland School of Med.